A certain faction of Melissa McCarthy’s fans won’t know what hit ‘em when they get a look at “Can You Ever Forgive Me?” I’m not suggesting they, or anyone, skip it; it’s one of my favorite pictures of the year. But McCarthy is taking on a role in a different comic (and dramatic) register than the ones that made her famous. McCarthy knows a lot about a lot as a performer, and she’s smart enough to widen her range. One her standout vehicles, “Spy,” took advantage of her less brash, more interior qualities, as did the earlier Bill Murray-led heartwarmer “St. Vincent.” Plainly McCarthy was more than ready for this unlikely triumph of a biopic. The whole movie’s terrific — a little funny, a little sad, a sharp evocation of early 1990s literary Manhattan as seen from both sides of the window pane. Looking out. And looking in. In 1991, celebrity biographer and multidirectional crank Lee Israel found herself desperate, between projects, unable to get her calls returned, alone with her cats and behind on her rent. Then she hit on a moneymaking idea that also scratched her literary itch: Across nearly two years, with the help of a barfly accomplice, she carefully forged 400-odd letters presumably written by her literary and show business idols, Noel Coward, Marlene Dietrich and Fanny Brice among them. The scam worked until it didn’t. After the feds caught up with her, and she paid her debt to society, Israel published her confessional memoir “Can You Ever Forgive Me?” in 2008. More recently screenwriters Nicole Holofcener and Jeff Whitty began developing a script, which for a time was to co-star Julianne Moore and Chris O’Dowd. That didn’t work out, but McCarthy and Richard E. Grant did. With the guidance of director Marielle Heller, everything else did, too. Heller’s first film, “Diary of a Teenage Girl” (2015), qualifies as the best American coming-of-age picture hardly anyone saw. “Can You Ever Forgive Me?” is a different story, but both her films to date succeed by finessing each scene, each relationship, every little slight and grace note. The analog early ‘90s world, before eBay, Amazon and the digital insurrection, comes to life in subtle but indelible ways, from the grating hum of an electric Smith-Corona typewriter to the burnished glow of Brandon Trost’s cinematography. Grant plays Israel’s sometime friend and sometime partner in deception, a gadabout named Jack Hock. The role has been embellished a good deal for the film version; Grant’s outre comic flourishes are pretty priceless, and he works off McCarthy’s dour, cynical demeanor like a master. The script requires more than comic wiles, though, and this is where Heller’s film pays off. A tentative romance between Israel and an open-hearted bookseller (Dolly Wells, excellent) generates a world of feeling just outside Israel’s grasp. Jane Curtin plays Israel’s socialite agent, with just enough edge to make her interesting. Stephen Spinella and Ben Falcone portray two very different sorts of used-books memorabilia experts, both alert to the possibilities afforded by Israel and her latest finds. ​Wisely, Heller doesn’t inflate the tone or impart an overt message. 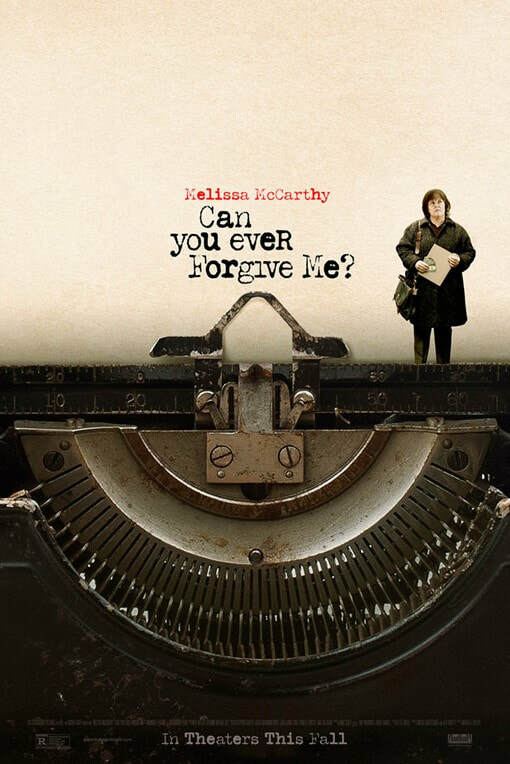 But by the end, “Can You Ever Forgive Me?” has truly brought you into this woman’s life, head-space, longings and tastes, and I found the whole of it quite moving. The lovely, delicate jazz-based musical score by Nate Heller (the director’s brother) doesn’t hurt; nor does a judicious use of standards and covers from earlier times, and a more elegant, romantic Manhattan. More than once we hear from the vocalist and pianist Blossom Dearie on the soundtrack. That’s practically four stars right there.